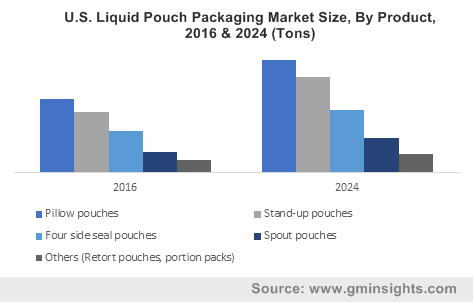 Liquid Pouch Packaging Market size was worth over USD 5.5 billion in 2016 and is foreseen to surpass 7,000 kilo tons by 2024. Changing lifestyle along with increase in travelling frequencies resulted in increasing need for convenient packaging solution. Flexibility, easy to carry and lightweight properties have enhanced the convenience for the liquid pouch packaging. Necessity for attractive packages with extended shelf life has enhanced the product scope. Potential applications including food & beverages, home care, personal care and industrial applications will drive the liquid pouch packaging market. Rising demand for ready to cook food due to the hectic schedules particularly in urban regions will propel the product demand. Global packaged food industry was worth exceeding USD 2.6 trillion in 2016. It is an environment friendly and sustainable solution, as it uses less material and reduces wastage. Moreover, it requires less storage & handling, less fuel for transportation and reduced emissions. Carbon emission reduction up to 93% as compared to rigid containers and storage space reduction up to 96% as compared to plastic bottles can be obtained. Increasing consumer health consciousness resulting in rising demand for liquid diet will propel the industry share. Increased stand-up pouches penetration due to its ability to stand upright and decorate the retail shelf will fuel the industry demand. Global stand-up pouch sales have increased by 30% in the past three years. Shifting brand owner preference towards convenience packing to differentiate, position and promote their product will propel the business growth. Growth in the global organized retail industry is the factor fueling the industry growth. The U.S. retail sales growth accounted for 2.9% in 2016. Strong outlook for FDA approved, food grade and flexible packaging particularly for infant food will drive the product penetration. It offers mess free food consumption owing to its fitments including pour spouts, re-sealable caps, and tubes. Fluctuating raw material prices along with rising demand for polymers will influence the liquid pouch packaging market price trend. Extensive R&D along with technological advancement to improve the design and utility are the key factors driving the industry demand. High convenience, cost -effectiveness, disposability, easy to carry and maintaining freshness are the key factors positively influencing the product penetration. Stringent regulations on recyclability of materials may restrain the industry growth. Flexible liquid pouch packaging market was worth over USD 5.3 billion in 2016. Rising demand for carry and go and disposable products will support the product demand. Ease of colorful printing & labelling has enhanced the product penetration. High adoption of rigid packing for food & beverages and pharmaceuticals will drive the industry growth. Less storage and lightweight properties have enhanced the reduction in transportation cost and carbon emissions. Polyester is anticipated to surpass 550 kilo tons consumption in liquid pouch packaging by 2024. Increasing demand of polyester resin based liquid pouch packing used in food & beverages industry is likely to drive the liquid pouch packaging market demand. In recent years, these resins usage in the production of flexible and rigid packing materials has enormously increased due to low production cost. High chemical & water resistance, great seal-ability are the crucial properties driving the aluminum demand in the industry. Fundamentally, aluminum is used as a laminated foil in the liquid pouches to meet the high barrier protection from oxygen, moisture and light to maintain the better taste of edibles and shelf life of products. Excellent optical clarity, insulation, moisture barriers for short shelf life products, low thermal conductivity are the significant factors driving the polystyrene raw material demand. Pillow pouches lead the overall liquid pouch packaging market. Increasing demand from dairy industries for packing numerous products including curd, sauces, milk, yoghurt and water will substantially provide a positive impact on the liquid pouch packaging market over the forecasted period. Spout pouches are the fastest growing segment and will witness over 6.7% CAGR up to 2024. Attached spout in the pouch helps in effective product consumption with a use of external utensils. Yogurt, infant food, and applesauce are major applications. Easy to handle, carry, ready to pour and chaos free food consumption are factors driving industry growth in this segment. Food & beverages dominates the overall liquid packaging market worldwide owing to rise in consumer spending and awareness towards hygienic food & beverages packing. Food & beverages holds over 50% of the industry share in 2016. Baby food, viscous & pasty products majorly contributes in the overall liquid pouch packaging market. Liquid pouches are generally widely used for lubricants, paint & coatings and fluids. Increasing construction spending along with infrastructure development particularly in developing countries will drive the demand. Rapid expansion in automotive sector will support product demand for lubricants, grease, engine oil and paints applications. Economic growth and increasing investments in the research and development facilities by various players will enhance the technology adoption. Form fill seal technology accounts to be the most prominent product manufacturing technology due to its ease of producing high yield in a single process time. Growing demand for drug sterility and hygienic storage and distribution will propel the demand for aseptic packaging technique. This technology is utilized to safeguard food from germs for a period of 8 months under normal room temperature. As per UN, global population of 7.35 billion people consume packaging worth more than USD 114 per year in 2015. Asia Pacific is the fastest growing region owing to high demand of stand up, spout and pillow pouches. Growth in population along with rising income level are crucial factors for the growth of product demand as it is used for several products including juices, sauces and creams. The U.S. liquid pouch packaging market will witness over 5.5% growth up to 2024. Rising preference for convenience packing along with regulations including Labelling Act, California's Proposition 65 and Poison Prevention Packaging Act, 1970 support the industry growth in this segment. Europe liquid pouch packaging market will witness notable growth from food & beverages application. Fast paced lifestyles coupled with rising demand from consumer for small and convenient packages will propel the business growth. In Middle East & Africa, consumers are gradually exposed to modern, which is offering them with large growth opportunity for carbonates, yogurt, sour milk and soft drinks product. Low raw material costs coupled with industrial expansion has enhanced the product demand for industrial applications. Global liquid pouch packaging market is fragmented owing to the presence of large number of industry players. The market for this industry is extremely unorganized due to small and medium manufacturers. 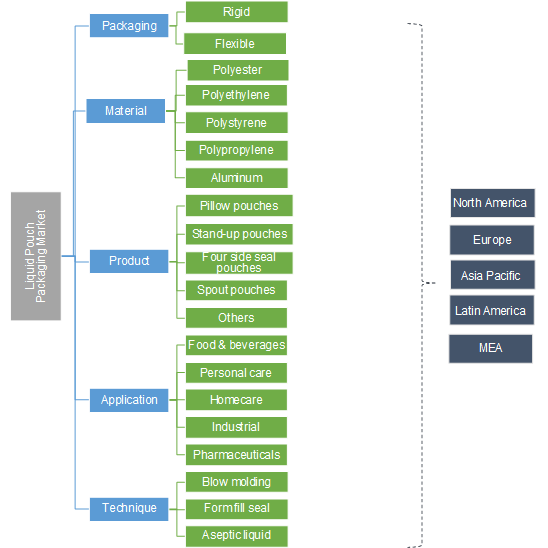 Several key liquid pouch packaging market companies are working on new products launches and industrial expansion are their key strategies to expand their foothold in the industry. North America and Europe market share are mature owing to steady population growth and saturated market demand. Strengthening distribution channel and research & development facilities for better product innovation are the crucial steps taken by the firms operating in this region. The key industry participants in North America and Europe include The DOW Chemical Company, Tetra Pak International, Smurfit Kappa, Weyerhaeuser Company, Billerudkorsnas AB, Bemis, IMPAK Corporation, and Ampac. Liquid pouch packaging is a specialized technology that is used to contain and handle several consumables including food & beverages. Protection from adulteration and damage during storage & transportation are the key features offered by the industry. It helps in preserving the freshness of the product and plays a significant role in protecting the product from the harmful effects of moisture. Aseptic technique is the most broadly used technology. These types of pouches are usually made of paperboards consisting of thin layers of plastics and aluminum. It helps in preserving food items for a long period, thereby reducing the need for added preservatives.